HAPPY BOOK BIRTHDAY, THE NINE! TODAY’S BREW: Still Autumn Roast. Though I might find a Christmas one since we took the tree down. Sad face. Christmas may be over, but gifts still come your way, as our dear friend, Julie Elizabeth Hill has realeased the third book in THE MIRRORS OF BERSHAN series today! LOOK AT THAT COVER. LOOK AT ALL THREE COVERS. So pretty I want to die. Here is an exclusive on the new book, and all the ways you can find it and J. Liz. So go do that right now. Get lost in this post first. Civil unrest is being stirred by unseen hands in the Rianzire Empire. The Prince’s secret has been revealed; laws have been changed. Worse, a second Mirror of Bershan has gone missing. When the Emperor involves himself directly in this mystery, the results are disastrous. After defeating the demon Aviatrez, Faylanna and Tavis return to Rianza, hoping their troubles are over. Faylanna is uneasy about the recently revealed truths of her childhood. Tavis is worried for his father, Crown Prince Keari. They find all is not well and nothing is as expected on their arrival. Unable to ignore her problems performing magic any longer, Faylanna insists on leaving Rianza in search of a solution. Tavis’s inability to come with her is no deterrent, nor is the unborn child she carries. Faylanna leaves his side as Tavis is duty-bound to remain in the capital with his father. For the first time since meeting, they’re parted and neither expect the reaction of the magical bond they created between them. Can Tavis fulfill his duties and survive unexpected challenges, even as he fights the constant demand from their bond to find her? Is there a solution for Faylanna to find and what will be the price if she finds one? Haven’t tried the Mirrors of Bershan trilogy yet? Now’s the time to start. 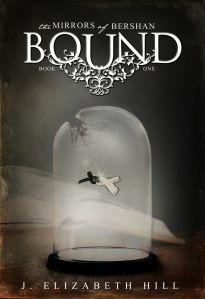 Bound, book 1, is on sale for a limited time! Just $0.99 for all electronic editions! Join Faylanna as she tries to escape her father’s hidden plans for her. Born in Toronto, Ontario, Julie Elizabeth Hill exported herself to Vancouver, British Columbia after many years of staring longingly at the map following every snowfall. For as long as she can remember, she’s been making up stories, but it wasn’t until high school that someone suggested writing them down. Since then, she’s been hopelessly in love with story crafting, often forgetting about everything else in the process. She is the author of The Mirrors of Bershan trilogy (Bound, Possession and The Nine). TODAY’S BREW: I already told you. I drank a bunch of coffee. Jeesh. We are honored to have our sweet friend, Julie Elizabeth Hill, give us a sneak peek into her upcoming novel, POSSESSION, the sequel to BOUND. She’s a wonderful friend, a dedicated and brilliant writer, and we wish her every bit of luck that there ever is, ever. Faylanna finds an old journal of her father’s, one that shakes her understanding of her own past. Worse, Faylanna and Tavis are both nearly killed when attacked by one of the men set to guard the Ninth Mirror of Bershan, still residing at Iondis. In the aftermath, he disappears with the newly-found journal. Sure there is more to this event than they know, Faylanna and Tavis return to the capital, Rianza, for help. Tavis looked down and hesitated. Her eyes followed his and she saw her name. The journal began again after the torn out pages, but her name headed the entry, right after the date. She began to read again, and it was immediately clear that he had been writing a letter to her, not a journal entry. This time, it was harder to read, and his sloppy writing was only part of the reason. There were stains on the paper that she thought were from tears, and brownish smudges that she was afraid might be long-dried blood. Her hands were beginning to shake now. She could hear in these words the echo of things he’d said, particularly his last words to her.